In a park in downtown Yangon, a mix of passers-by and snack venders milled about, watching curiously as a pack of reporters jostled amongst themselves for a position. The focus was fixed on several dozen people standing in rows, some holding black balloons, others holding signs. One sign read “Murder is not a state secret”. The verdict has drawn widespread international condemnation. Images of the pair, shackled but defiant, being led from a packed courtroom in northern Yangon, bundled into the back of a police car and whisked off to Insein Prison, were beamed around the world. At Sunday’s peaceful gathering, the first since the 3 September verdict, a mixed crowd of protestors and journalists called for their release. Myanmar’s government says the pair were found in possession of “secret documents” during a routine search at a police roadblock on the outskirts of Yangon on 12 December. Wa Lone and Kyaw Soe Oo, who pleaded not-guilty to the charges, say they were the victims of a police set-up designed to stop the truth from getting out. To that end, the set-up failed. 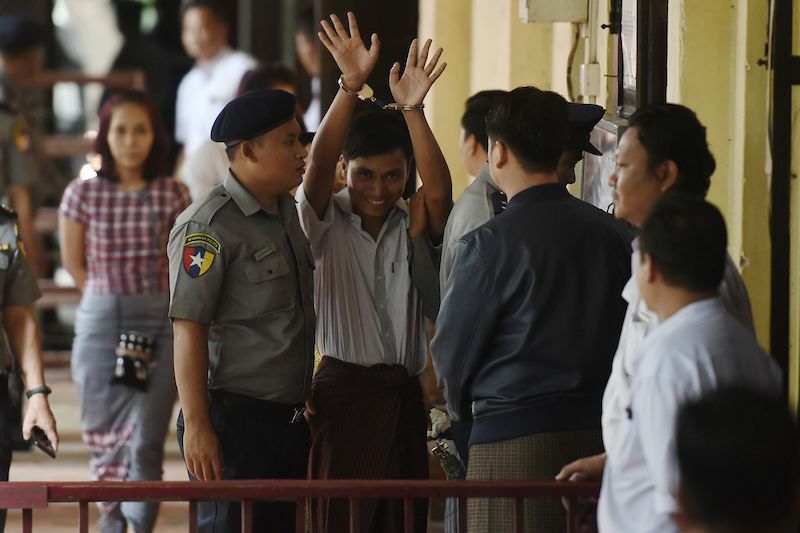 Their reporting would later force the Myanmar military, known locally as the Tatmadaw, to sentence seven of its troops to 10 years in prison for the murder of 10 Rohingya civilians last September. And last month, the UN accused the Tatmadaw of genocide against the Rohingya in Rakhine State. But as the trial progressed, often under farcical circumstances, it became increasingly clear the two journalists were being made an example of. At one point, a police witness told the court he couldn’t produce his notes from the evening of the arrest because he had burned them. Another sat in the dock with his testimony and the names of the defendants written down on his hand so he wouldn’t forget them. Then came the extraordinary testimony of prosecution witness Moe Yang Naing. Present on the night of the journalists’ arrests as well as at the September massacre, Moe Yang Naing, a police officer, told the court in April that he and other officers were ordered by a senior police captain to trap the journalists by meeting them at a restaurant and giving them the “secret documents”. The whistleblower was immediately sentenced to a year in jail for serving as a source to the reporters. They were not jailed because they were journalists, they were jailed because … the court has decided that they have broken the Official Secrets Act … If anyone feels that there has been a miscarriage of justice, I would like them to point it out. Suu Kyi’s comments, which were slammed as “unbelievable” by Nikki Haley, US ambassador to the United Nations, came as a surprise to many, as they represent a public shift from her tacit to outright endorsement of the suppression of local journalists. Since Suu Kyi and her National League for Democracy party took control of Myanmar’s parliament in early 2016, upwards of 29 journalists have been charged under obscure laws – most notably a draconian online defamation law – for doing their jobs, far more than were charged under the previous military-backed government. At the Union Parliament in Naypyidaw, journalists find NLD lawmakers increasingly illusive, except when they are lecturing reporters about media ethics. Suu Kyi has yet to grant a single interview to a local journalist since she created the office of State Counsellor more than two years ago. Earlier this year, veteran journalist Aung Hla Tun was appointed deputy information minister, giving him a key role in crafting state propaganda. An award-winning former Reuters reporter himself, Aung Hla Tun now sees himself a custodian of the country’s image. “The greatest responsibility of media today in Myanmar is safeguarding our national image, which has been badly tarnished by some unethical international media reports,” he said at the Forum on Myanmar’s Democratic Transition in August 2017. It is no secret that Suu Kyi does not tolerate dissent from within her party, and this extends to members of her country’s fourth estate. When US diplomat Bill Richardson raised Wa Lone and Kyaw Soe Oo’s case privately with Suu Kyi, she reportedly grew furious and called them “traitors”. Richardson, who resigned from an advisory panel on Rakhine State this year after condemning it as a whitewash, has since said that the verdict is “a farce” and makes “a mockery of justice”. 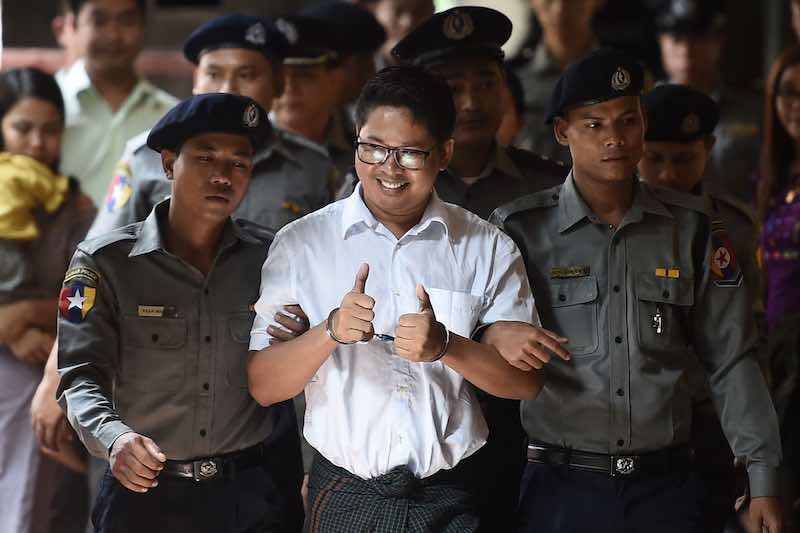 The trial of Wa Lone and Kyaw Soe Oo was a farce and the sentencing is a mockery of justice. Sadly, I am not surprised by the verdict and sentence. Despite Suu Kyi’s stranglehold on her country’s image at home, a small and isolated community of independent journalists and activists are fighting for the democracy they came to expect when she came to power. 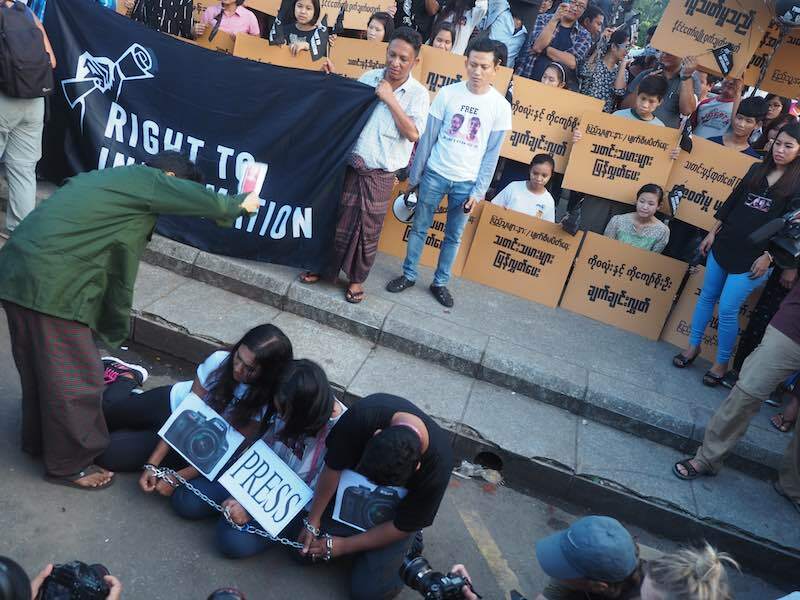 Last week, 83 local civil society organisations criticised the Reuters trial as “neither free nor fare and completely manipulated” and called for the journalists’ immediate release. The secretary of a foundation formed by U Win Htin, one of Myanmar’s longest-serving political prisoners and co-founder of the NLD, also demanded their release. How is democracy supposed to work when journalists are being oppressed?